The 2013 Gatornationals champion who made his NHRA debut at Gainesville Raceway atop a Pro Stock Motorcycle in 1998 qualified fifth for the 50th running of the prestigious event. 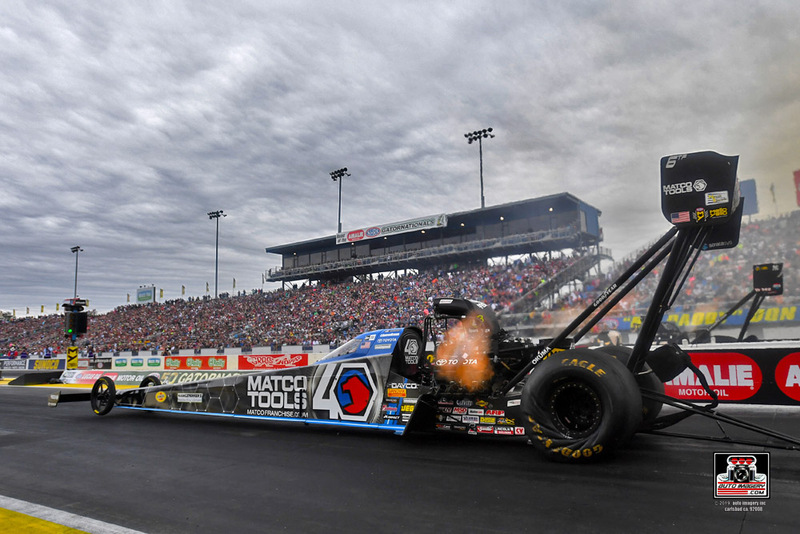 Against his first-round opponent Richie Crampton, Antron Brown was quick on the throttle, earning a significant starting line advantage over his competitor. Crampton was able to take over the lead almost immediately when Brown’s machine rattled the tires and lost traction. Brown pedaled but was unable to chase down Crampton’s 3.783 second pass. 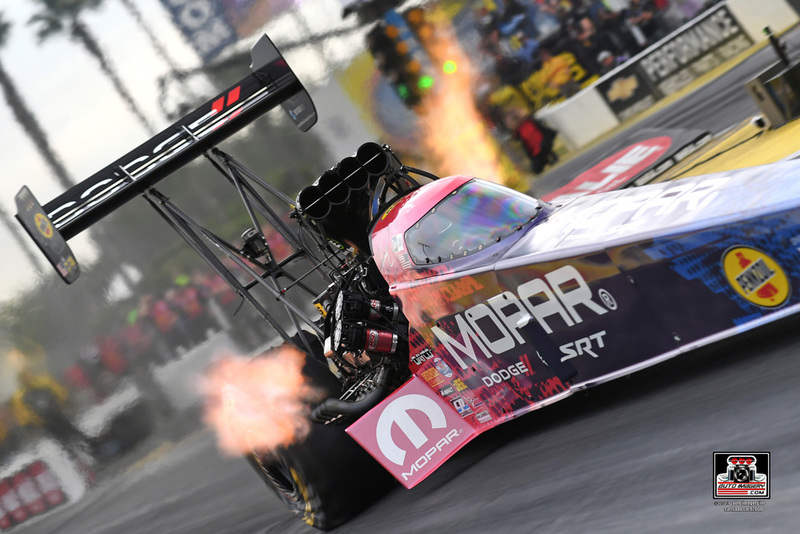 Leah Pritchett came into Gainesville looking to become only the third female driver to hoist a Gatornationals Top Fuel Wally and positioned herself well by qualifying the MOPAR Dodge Top Fuel Dragster No. 4 in the field. In her opening round matchup with Pat Dakin, Pritchett posted a lap of 3.724 seconds at 327.59 mph to score the victory over Dakin’s 7.999 E.T. In the second round, Pritchett took on defending Gatornationals champion and eventual race winner Richie Crampton. The difference turned out to be the advantage Crampton got at the start with his 0.022-reaction time followed by his run of 3.785 seconds to defeat Pritchett by 0.0126 seconds following her 3.739 second pass. 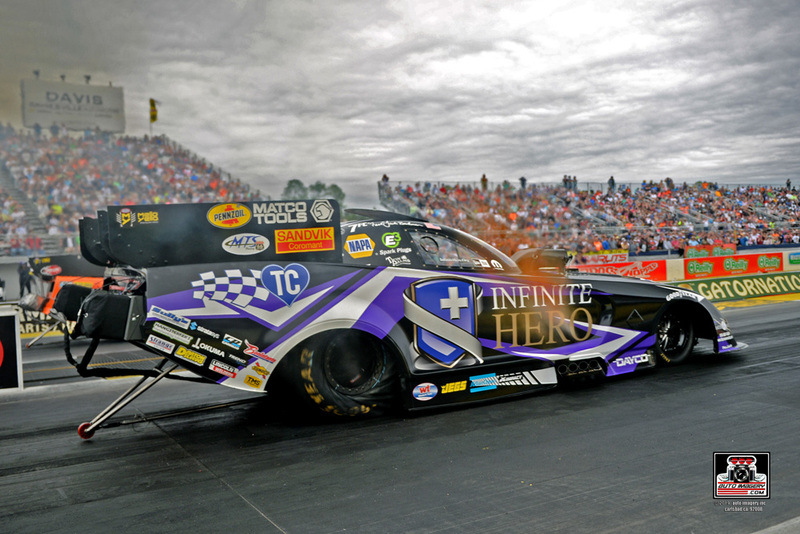 Defending Gatornationals Funny Car champion Jack Beckman was looking to become the seventh driver to win back-to-back at Gainesville Raceway, but he was knocked out in the semifinals by Tim Wilkerson. Behind the wheel of the Infinite Hero Foundation Dodge Charger SRT Hellcat, Beckman earned the No. 6 position on the elimination ladder with his qualifying run in Saturday’s final session. He continued his quest for history at the 50th annual Gatornationals by defeating reigning Funny Car world champion J.R. Todd with a pass of 3.905 seconds. In round two, it was a duel of Hellcat Funny Cars with Beckman scoring a narrow win with his pass of 3.898 seconds at 329.67 to defeat his teammate Tommy Johnson Jr., who posted a run of 3.892 seconds at 327.03-mph. Beckman’s six-round win streak at the Gators came to a halt in the semifinals when Tim Wilkerson raced away with his pass of 3.896 to best Beckman’s run of 4.211. As the second-winningest Funny Car driver of all time, Ron Capps has amassed 60 Funny Car victories and was hoping to add the golden 50th annual NHRA Gatornationals Wally trophy to his growing collection. 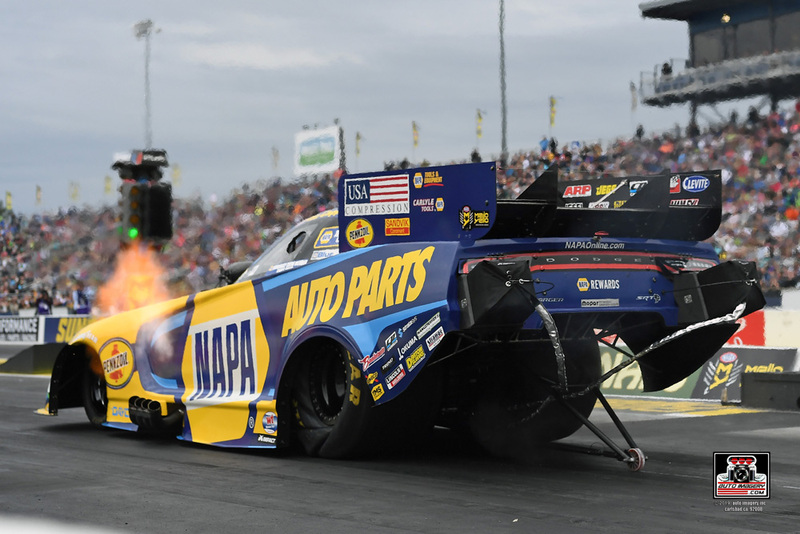 Armed with a brand-new chassis, Capps and the Rahn Tobler-led NAPA AUTO PARTS team qualified in the top half of the field to earn lane choice over first-round opponent Bob Tasca III. Capps powered the NAPA Dodge Hellcat to a 3.910-second pass to take the win over Tasca’s 3.969 E.T. and set up a quarterfinal meeting with Robert Hight. Capps and Hight had nearly identical reaction times, but the race was over as soon as Capps stood on the gas. His 11,000-horsepower machine immediately went up in smoke and he watched as Hight drove away with the round win. “We were trying to find ourselves this weekend. We came here after a great test session in Phoenix with our brand-new DSR chassis. It’s not like we were that far off this weekend, it’s just Tobler’s been fighting some new car blues. This is just something you go through when you bring out a new car. Sometimes everything comes out perfect and sometimes you’ve just got to chase adjustments here and there. “Tobler did a great job to bounce us back in qualifying and then to go up there against a very tough team with Tasca’s car and go 91 in the first round was good, but he still wasn’t comfortable with the car and was still making adjustments. As the most recent Funny Car winner on tour and 2018 Gatornationals runner-up, Matt Hagan looked prime to capture his first Gainesville Raceway Wally trophy on Sunday at the 50th running of the event. 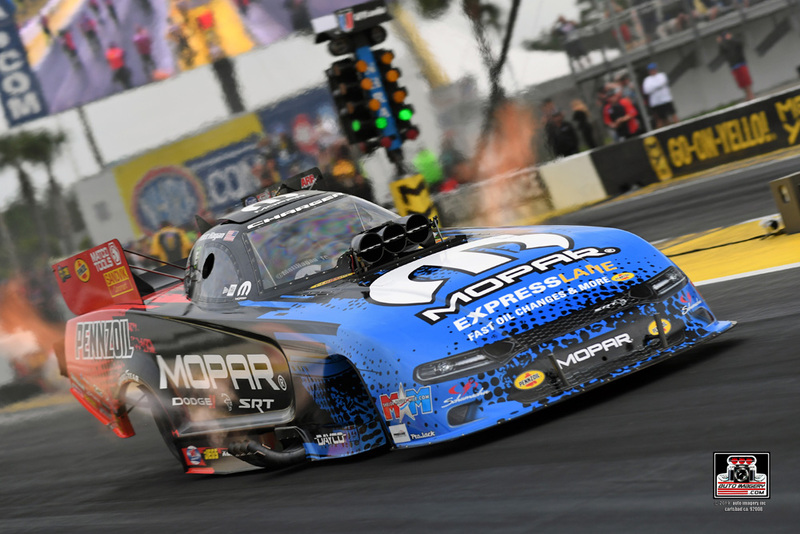 Against his first-round opponent Jonnie Lindberg, Hagan wheeled his MOPAR Express Lane Dodge Charger SRT Hellcat to a 3.941 second run to claim the round win and setup a quarterfinal matchup with John Force. In round two, Hagan was first on the throttle but went up in smoke early into the run and was forced to watch his competitor drive away with the round win, dashing the Virginia native’s chances at his first Gainesville winner’s circle celebration. Tommy Johnson Jr. qualified third to start race day at the NHRA Gatornationals with a round-one matchup against part-time racer John Smith. 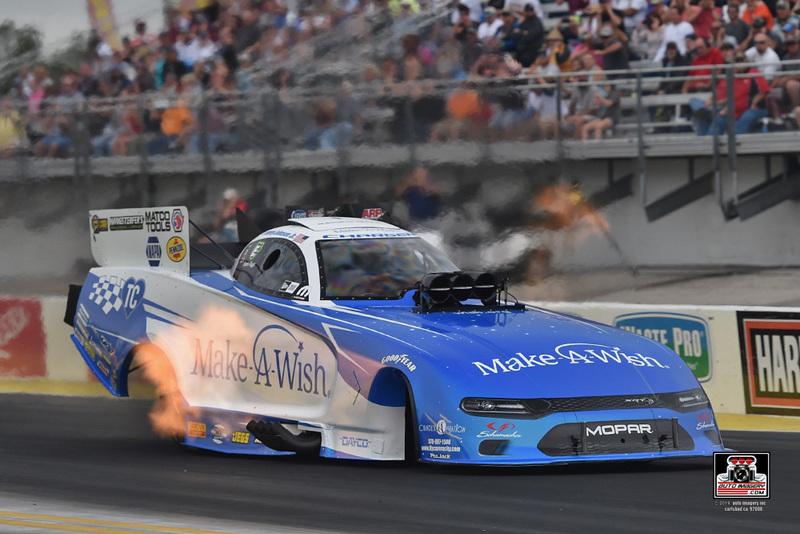 Johnson navigated his Make-A-Wish Dodge Hellcat cleanly down the track in 3.905 seconds to take the win over Smith’s 4.353 second pass. Round two featured an intramural battle between the Chandler family’s ‘giving cars’ with Johnson lining up opposite teammate Jack Beckman behind the wheel of the Infinite Hero Hellcat. Johnson and Beckman clocked nearly identical reaction times (0.069 versus Beckman’s 0.063) and maintained pace until just before the finish line when the Infinite Hero Dodge pulled ahead to claim the holeshot victory.